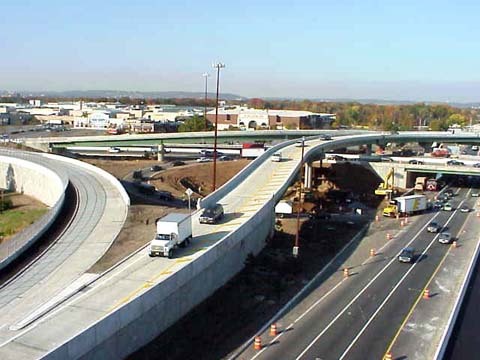 On the left is the new Northeast ramp (from Route 17 Northbound to Route 4 Eastbound) scheduled to be opened to traffic on 10-27-99. In the center is the Southeast flyover (from Route 17 Southbound to Route 4 Eastbound) already in use. To the right is Route 4 Eastbound under construction while maintaining traffic. On the right is the new ramp from Route 4 Westbound to Route 17 Northbound. Only half of the ramp width is currently open to traffic.